Posted: Tuesday, December 4, 2018. 2:57 pm CST. 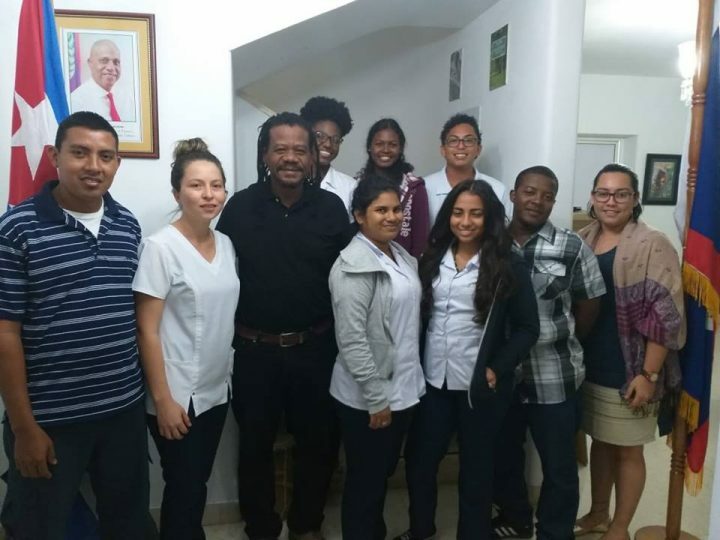 By BBN Staff: On November 29, 2018, while on an official visit to Cuba, Edmond Castro, the Minister of Transport and National Emergency Management, met with a group of Belizean scholarship recipients who are studying at the Latin-American School of Medicine (ELAM) in Cuba. Castro hosted the evening event to hear from students and to encourage them in their studies. Firefighters Samuel Leslie of the Orange Walk Fire Department and Victor Menzies from the San Ignacio Fire Department, who had been training in Havana, also joined the group at the Embassy of Belize to share their experience. Castro conveyed his admiration and appreciation to the Cuban Government and People for the high quality of their cooperation and contribution to the development professionals in medicine and in emergency management services in Belize and across the region. There are currently 87 Belizeans studying in Cuba.